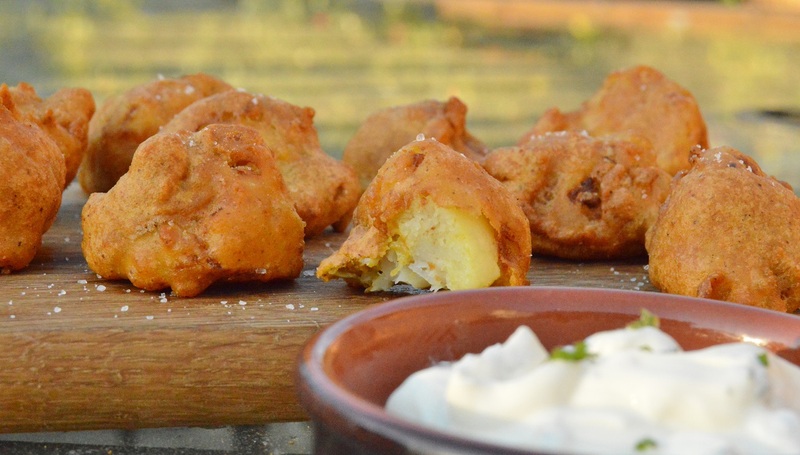 This is my take on cauliflower bhajis: they are great served with cold drinks or just placed on the table with a cool minty dip for people to just tuck into. I made these during the semi-final of Britain’s Best Home Cook, and while they needed more heat, they went down very well. They are very crisp, incredibly light and are packed with flavour – as indeed they should be – with a kick of heat from fresh chilli. 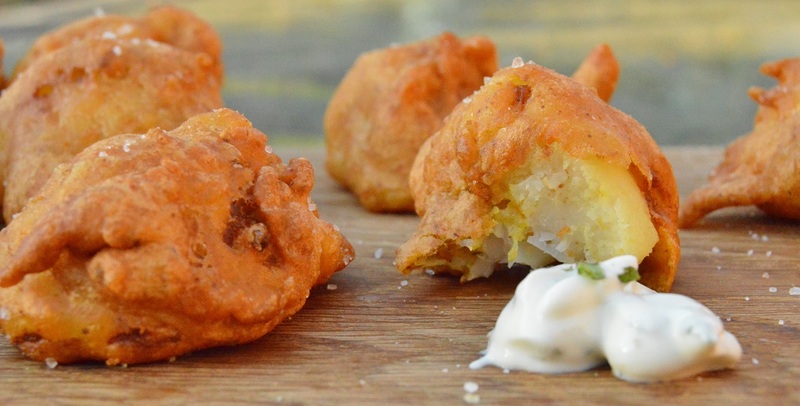 The mixture of gram (chick pea) flour and rice flour gives a crisp batter that shatters as you bite into the fritters, but you can use all gram flour. You can also make these with plain flour if you don’t have gram flour. I have used some of my favourite spices, but have aimed not to have any dominating; I think the combination of spices I have gone for gives a batter that has depth of flavour. 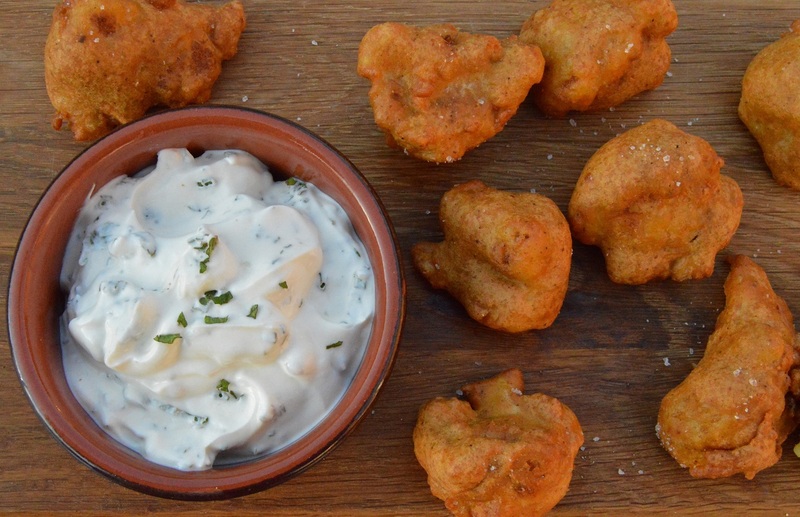 While I cannot vouch for the authenticity of these fritters, when I served a plateful of these recently, they were gone very quickly with people coming back for extra helping – always a reassuring sign! I am such a fan of fennel (as a herb/spice, as a vegetable….in any shape or form!) that I couldn’t not use it here, along with some more traditional spices. Here I have used fennel powder, which has become one of my must-use spices since discovering it from Absolute Spice. It is so versatile for all manner of foods, with one of my favourites being a great addition to pastry. I have also used the same batter to make onion and fennel bhajis, using sliced red onion, white onion and fennel bulb and dropping teaspoons of the mixture into the hot oil. My favourite dip to serve these with is a very simple yoghurt and mint dip: made in seconds, it’s tangy, slighty salty and with a hint of sweetness: very refreshing! You do need to serve them as soon as they have been deep-fried as they soften a little, but you can re-heated some in the oven on a high temperature (190C fan) for about 5 minutes to crisp them back up. I have also made up a large batch of these the day before and popped then on the barbeque for a few minutes: they crisp up wonderfully. (1) Place the cauliflower in a pan of boiling water, along with 1 teaspoon of turmeric. Simmer gently for no more than a couple of minutes: you want the cauliflower to just become a little softer but not at all mushy. Drain fully and allow to dry. 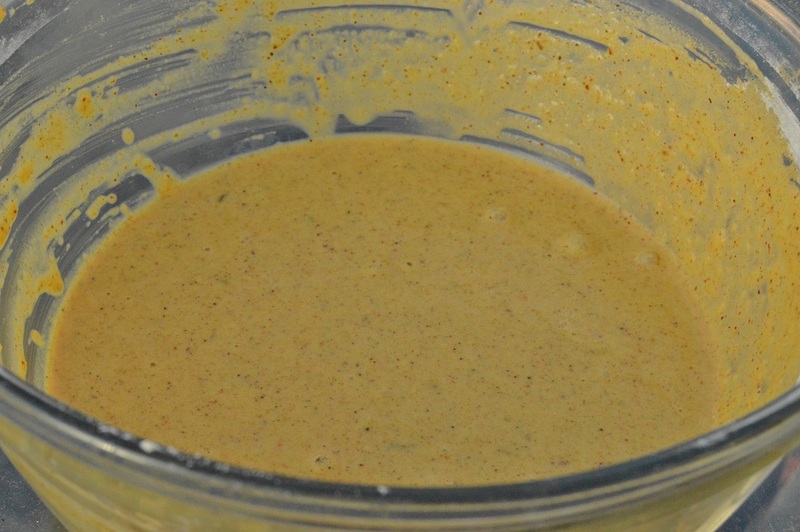 Mix with the gram flour to gve a light coating: this will help the batter stick. Set aside until you are ready to make the fritters: this can be done up to a few days ahead. (2) Make the batter: put the onion, garlic, chilli and water into a small blender and blitz to give a very smooth oniony-garlicky liquid. Add to the rest of the batter ingredients and whisk to give a smooth, thick batter. (3) Make the dip: mix the ingredients together, adjusting the salt, sugar or lime according to taste, aiming for what you think is the right mix of salty, ever-so-slightly sweet with a touch of sour from the lime. (4) Mix the cauliflower with the batter, getting them very well coated. Deep fry at 180C for about 7 minutes until crisp and deep golden brown. Drain, pat dry on kitchen towel and sprinkle over some sea salt and a spritz of lime juice. Serve immediately. Sounds very delicious, would love to try!